There are 10 key picture book concerns that crop up with alarming regularity! Almost every manuscript we see has at least one of them, and most manuscripts have two or three! In this course, I cover 5 of those issues (picture book or short story, kid-friendliness, nostalgia, quiet picture books, and sounds/words), and Part b covers the other 5 (length, focus, point of view, freshness, and illustration potential). [Note: It doesn't matter which order you take the courses in.] In each video, I showcase a key question you will want to ask yourself about your manuscript. Then I offer some tips and techniques to fix the problem if you discover that it does apply to your work.The 5 videos total 1 hour and 6 minutes. 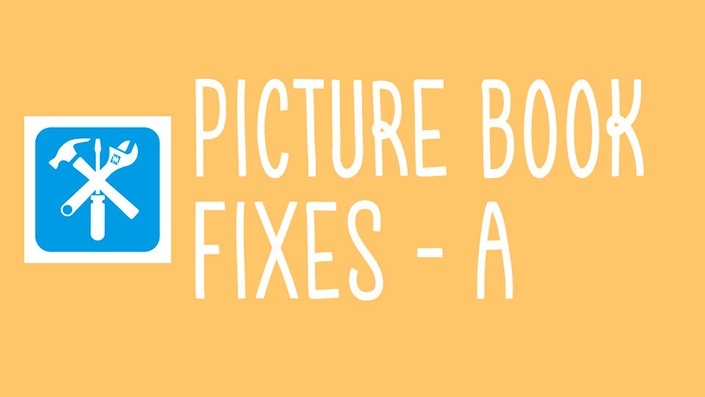 This plan includes access to the five modules of Picture Book Fixes - A. It also includes a downloadable sheet that goes with each video module.